Potholing and caving are adventurous pastimes and while some participants only do it as a means of physical activity, the majority do it for the exhilaration in being able to explore places where no one has been before. Given its extremely dangerous setting where climbing, digging, crawling and squeezing through extremely small spaces, sometimes filled with water, is the norm, the accident rate involving cavers is quite low. Unfortunately when an accident does happen the results can be serious and in some cases fatal. It's important that beginners are aware of the dangers and accept that there is an element of risk when potholing or caving. A common sense approach has to be taken when participating in the sport, and good preparation, organisation and leadership skills are vital if setting out to explore a cave. The main dangers involved in potholing are: falling, hypothermia, flooding and physical exhaustion. Rescues from an underground location are difficult and need to be carried out by teams of trained cave rescuers, using specialised equipment, who will be put at risk themselves while undertaking a rescue. These risks can be minimised if certain techniques and guidelines are followed. Helmets - Worn to protect the head from falling rocks and any bumps that might occur when squeezing or climbing through narrow gaps. A main light source is normally attached to the helmet so hands can be kept free, halogen lamps are the standard but new white LED's are becoming more common. Carbide systems are also popular. A back up source is also worm on the helmet by most cavers. Flashlights - A small flashlight is carried by some potholers. Footwear - Boots are usually worn in drier caves, while rubber boots with neoprene wet socks are worn in wetter caves. Clothing - Knee pads and elbow pads are normally worn along with gloves to provide protection when crawling. Depending on the local climate and conditions of the expedition clothing varies. A caver may wear a base layer like a fleece (which retains some warmth if it gets wet) thermal underwear and waterproof jacket and overtrousers. A wetsuit is worm if wet conditions are going to be encountered. Lighter clothing may be worn in hot conditions in tropical caves for instance; thin polypropylene clothing is used, to provide some abrasion protection whilst remaining as cool as possible. Synthetic fibres and woolens that dry quickly, shed water and which stay warm while wet are more suitable than cotton fabrics. Ropes - are needed to ascend or descend vertical pitches. The ropes are usually rigged using slings, carabiners and bolts. First Aid Kit - Accidents can happen so a well equiped first aid kit with splints, bandages, plasters and other medical supplies should be carried. Someone who is qualified to use the medical equipment should be part of the party. Packs - Potholers also carry packs containing food, spare equipment (lamps, bulbs, ropes etc) and bathroom supplies (pee bottles). Prepare for the trip as best you can. Who is going to lead the trip? What is their experience? Have they experience of the chosen cave? Make sure you know the expected time that the trip will take. Leave word with someone of the time your party is expected to return, and a contact number for emergency services. Take note of the local weather forecasts and ground conditions. Will the trip be a dry or wet one? Wear appropriate clothing, and know how long will be spent in water, and how deep it is expected to be. Find out if the cave is prone to flooding. Are there any climbs or traverses, Will ladders or ropes be needed? Check equipment to make sure it is in good condition. If you become distressed or have concerns about the conditions make your feelings known to the leader of the group. Remember the route. 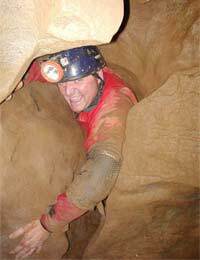 Even experienced cavers sometimes get lost. It's acceptable to mark the route using small piles of stones(cairns), or non permanent markings such as high visibility tape which can be removed on returning. Don't go potholing on your own. Three people is the recommended safe number in a party. Hypothermia is one of the main hazards and precautions must be taken to avoid it setting in. Proper clothing should be worn for the conditions, stay as dry as possible, eating properly before and during a trip, make sure the length and difficulty of the trip is appropriate for the fitness levels of the group. Sufferer lags behind, becomes slow in movement. Lack of interest, mental deterioration. Breath has an Acetone smell.